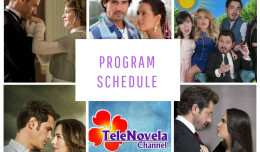 Passion: Episode 62 | TeleNovela Channel - Bringing you closer to lifes drama. Ricardo makes the necessary paperwork to give back Lisabeta’s inheritance while Lisabeta secretly plans to do the opposite of her end of the deal with Ricardo. Meantime, Ascanio asks Santiago to seek help from his father so that Camila might not get hurt along the process. Camila tearfully tells Ricardo that Lisabeta wants to hurt her because she is in love with him and that she cannot stand that she is his wife.